1. 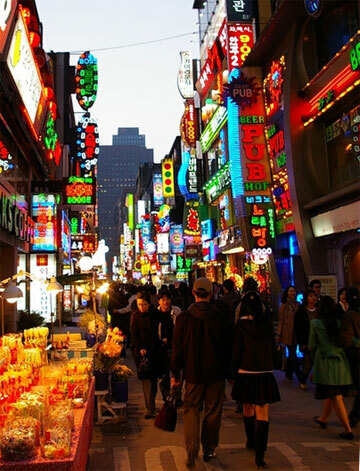 Seoul, South Korea (pictured) – The second most populated metro area in the world (22 million) plus a reputation as the world leader in modern technology helps make Seoul the undisputed leader. With 10mbps broadband (four times faster than in most U.S. households) for $20/mo. in 83% of homes, it’s no wonder video games in Seoul is the cultural equivalent of baseball in the U.S.
2. Taipei, Taiwan – With 90% of the 2.6M population has wi-fi access from $4.5-$12/mo., Taipei is #1 in the world when it comes to wireless. 3. Tokyo, Japan – With the most populated metro area in the world, connectivity is a must, and at 100mbps for $50/mo., it’s the biggest network in the world for ultra-high-speed networking and VOIP phone usage. 4. Hong Kong, China – At $16/mo. for 10mbps and $34/mo. for 100mbps and ubiquitous on-demand TV, it’s the best deal in the world. 5. Singapore – Already at 65% broadband penetration, Singapore’s government is arguably the most aggressive in establishing policies to make it a world leader. 6. Stockholm, Sweden – Limited by high costs, Stockholm is the most digitally connected in Europe and one of the most active internet gaming cafe cultures in the world. 7. ‘Various Municipal Projects, United States’ – St. Cloud FL (free wifi) and Mountain View CA (free wifi) lead the way in the U.S., while San Francisco, Philadelphia and Boston have plans for city-wide wifi as well. 8. Paris, France – Within 5 years the city will have $50mbps at $40/mo., and by then it’s world leading cafe culture will take on a whole new meaning. 9. Shoreditch, England – With Shoreditch TV, the entire city is a reality show. 10. Silicon Valley, United States – You’d think the home of the leading tech companies in the world would have something up their sleeves, and they do – free 1Mbps wifi for all 4.2M residents, lead by IBM and Cisco. what do you think in your honest opinion, of skyscrapers? I read over at Planetizen.com that a group of cities in the UK are planning on building a huge series bleak looking(in my opinion) waterfront skyscrapers in each town. Personally they look very impersonal to me, like industrial era buildings. do you think this is “cool town” inducing?? It’s not my opinion that counts, as the basic principle of cool towns is that they are customer-driven by the creative class. That said, I just don’t see the city’s most creative people collaborating on a vision to build more skyscrapers as the destination of choice for where they want to live and work. They look like giant steel long boxes to me..not very inviting.